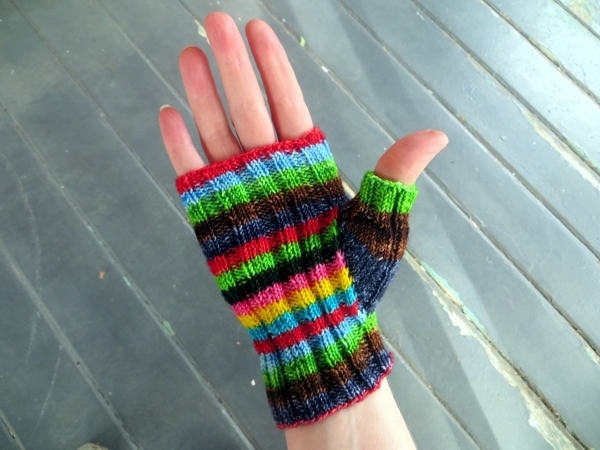 Your week has probably been entirely 100% free of curiosity about how the thumb turned out on my fingerless glove experiment but: too bad! Here it is anyway. I don't think it looks completely terrible here. Maybe a bit heavy on the dark colours, given how many brights are running around mid-palm. Trust me though, there are problems. My idea for shaping the thumb didn't work, so that part of the project was a bust. As you know, the thumb shaping was kind of the whole point, so: sad. Still, I salvaged it with an entirely different approach. That should be a plus, right? 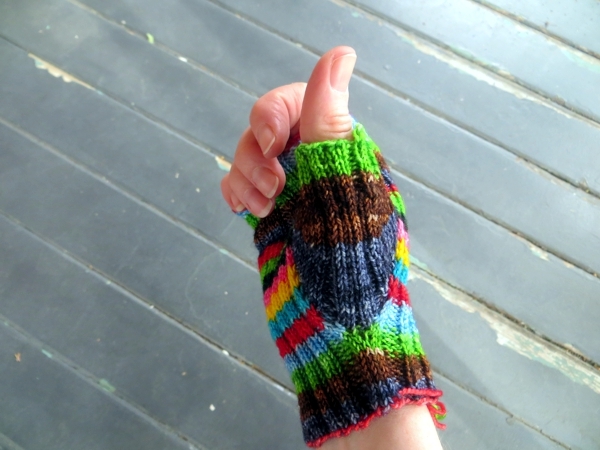 Probably when I was knitting I left the thumb opening way too wide for any human thumb, but a clever and quick approach to decreasing can fix that sort of problem. After all, what's less comfortable than a thumb that's too tight? That last icky was the root of it. The speed and efficiency of the decreases. See, the thumb shaping technique I ended up with - short rows - was a distraction from the all-important stitch reduction rendered essential by the too-big thumb opening. I put off the decreases, which means the thumb was too big for a lot of the time, and then very suddenly became very small. I know it doesn't look that bad in that shot, and that's because I'm on-purpose showing you the least awful one. Trust me, this thing looks like the nose on Angela Lansbury's teapot in Disney's Beauty And The Beast. And now, let me wish you a wonderful and productive June weekend, and a happy reunion for us all on Monday! Thanks for the tip Laurinda - I'll check them out! !